From the Two Bears drinking fountain, Kensington Gardens to Piccadilly Circus (3.5 miles). 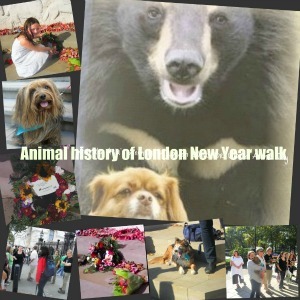 Do something different on the second day of 2012 and join our guided walk to discover London’s secret animal history plus raise vital funds to make 2012 and beyond happier years for the bears, cats and dogs in Asia. See London’s hidden Victorian dog cemetery, discover which London resident invented the cat flap, the name of Anne Boleyn’s favourite pet and which members of the royal family loved animals the most, plus learn about the mole that killed a king, the cats of London’s theatreland … and much more. This walk also includes laying a wreath at the Animals in War memorial and walkers are encouraged to bring their own tributes. As this walk is mainly through London’s parks and back streets, street-wise dogs are very welcome. This walk is restricted to 20 people and must be booked in advance.